The maximum range of a time-of-flight camera is limited by the periodicity of the measured signal. Beyond a certain range, which is determined by the signal frequency, the measurements are confounded by phase wrapping. This effect is demonstrated in real examples. 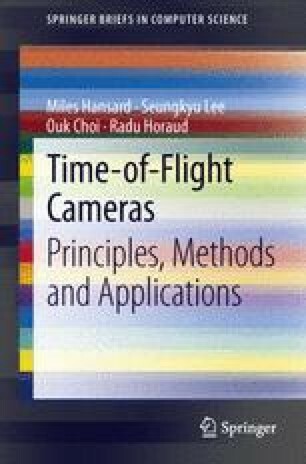 Several phase-unwrapping methods, which can be used to extend the range of time-of-flight cameras, are discussed. Simple methods can be based on the measured amplitude of the reflected signal, which is itself related to the depth of objects in the scene. More sophisticated unwrapping methods are based on zero-curl constraints, which enforce spatial consistency on the phase measurements. Alternatively, if more than one depth camera is used, then the data can be unwrapped by enforcing consistency among different views of the same scene point. The relative merits and shortcomings of these methods are evaluated, and the prospects for hardware-based approaches, involving frequency modulation are discussed.